One of the things that has always bothered me when it comes to fiberglass replica bodies is the lack of a realistic firewall. Most have something between a flat slab and a stylized version of the original. This is fine and these simple firewalls are designed to make engine installation easy for the builder but in my opinion they are a "red flag" giveaway that you're looking at a fiberglass car. The first thing I did was to take a look at my options for a realistic firewall. Basically I had three. Buy an original and graft it in place, buy a reproduction unit and graft that in place, or modify my existing firewall myself. Original Deuce firewalls are usually several hundred dollars and when you do find one, chances are it will not be in the best of condition. Reproductions like those available from Brookville Roadster for example are in the $600 range, which is way out of my price range. So, my only real option is to make one from my original. Given the cost of the other two options I believe I can modify mine for around $50 in materials and just a few days work. Now I know that I'm not going to fool anyone who knows Deuces by making my own realistic looking firewall but the whole idea here is just to make it look more realistic and not have it scream "FIBERGLASS" to everyone who sees it. If you are going to build a replica the more it looks like the original the better as far as I'm concerned so that's what I have done with the firewall of the Deuce.... made it more realistic. My deuce is a Dave Koorey 3 window body. Dave Koorey Street Rods manufactured fiberglass '32 and '33 Ford bodies out of Florida for several years. Unfortunately, due to financial difficulties he is no longer in business. I purchased this body almost 15 years ago when he was still building decent quality bodies at a very reasonable price. This body new was $3600. Now days you couldn't come near this for double that so even though it does have some drawbacks, it was well worth the money. One of those drawbacks is of course the flat slab firewall. 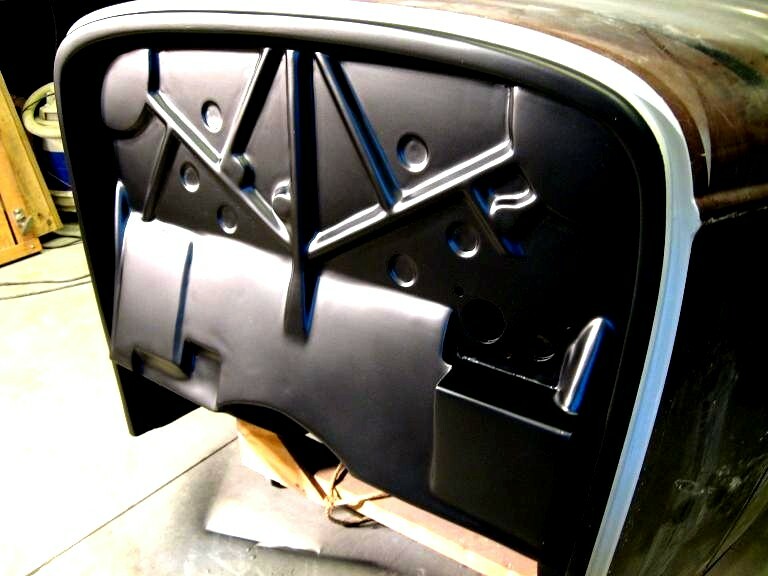 This is a stock 1932 Ford firewall. After doing some research and speaking with an expert on the subject I was able to verify this and also the fact that there were at least 4 different variations used in the production of the Deuce as well. This one is typical however and was used along with measurements taken off an authentic car to fabricate the new firewall. The first thing that needed to be done was to modify the steering column support so that it can be tightened around the steering shaft to securely hold the column in position. I made a slit in the tubing and a compression fitting was fashioned that can be simply tightened with a bolt to hold the column in place. Also note that I had to relocate the hole for the column lower than the factory location. This was because the heads on the hemi take up more room than your typical small block Chevy. I used the section I cut out to help fill in the original factory hole. What you see here has been glassed in from the interior side but has not been filled and glassed yet from the outside. The lower section was mocked up using cardboard and metal tape. Three layers of chopped mat were then laid over the cardboard mockup and glassed in place. The cardboard will stay inside using this method and that's OK. The other option would have been to finish the mocked up section and use it for a buck and make a mold. Then a piece could be laid up in the mold and then glassed in place. If I was going to make more than one that would have been the way to go but since this is a "one off" there was no need to go through the extra work involved in making a mold. The upper section was made from hardwood dowels cut in half and then both chemically bonded and mechanically bonded to the firewall. Basically they were glued and screwed in place. After the chopped mat was sanded a layer of body filler was used to smooth the transitions of the dowels and fill the imperfections in the chopped mat. After this was sanded another layer of woven cloth and resin was used to lock everything in place. The dowels were sealed with a layer of resin and once dry everything was sanded once again. When the cardboard mockup was made a hole was designed to allow clearance for the steering column and was made large enough so that a small ratchet can get in there to tighten the bolt and lock the column in place. The firewall was then coated with a layer of finishing filler and was sanded yet again. Then I shot the first coat of primer. There are a few areas that will need a little more finishing (pin holes etc.) but I'm pretty damn happy with the look and how well it came out. In this close up you can see the six dimples pretty well. This was done by drilling out the holes and then glassing in pieces of Luan plywood from the interior side. After the plywood was sealed with resin, the transitions were smoothed with a little body filler and Walla.... authentic looking dimples. You can see that on the driver's side there is plenty of clearance between the engine and new firewall. However, the clearance on the passenger's side is much closer. There is a half inch between the head and the firewall but where the water fitting cover is located there is only around a quarter inch clearance. This can be opened up to nearly half an inch by modifying the heads of the bolts that hold the rear water cover on. A half-inch should be enough but another option is to modify the firewall just a bit to open up the clearance to an inch in that area. Here is a shot with the master cylinder installed. As you can see, there will be plenty of room to run the brake and clutch hydraulic lines. And the finished product. It took about two weeks to make this firewall but I think it was well worth the effort. Although there are some subtle differences between an original Deuce firewall and this one, but I believe this modification adds a lot to the overall look of the body and will add a serious amount character to the finished car. The underlying philosophy when doing this was to do what I would have done if it were an original steel body and I was building it back in 1964. What I would have done to get a little extra engine compartment room would have been to recess the stock firewall an inch or two. This would have resulted in something that would have looked much like my finished product here. 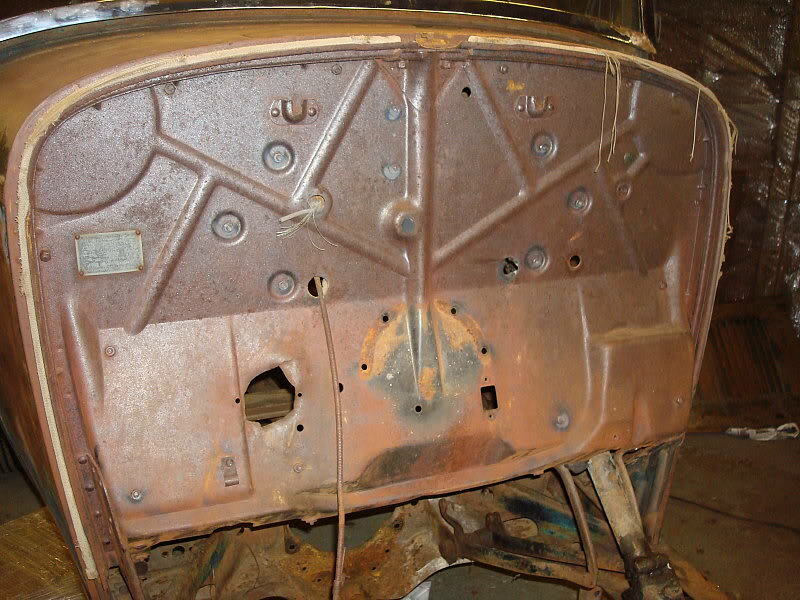 Also since recessing an original steel firewall would have required the removal of the "feet" (sheet metal feet that bolt to the frame on each side of the firewall), no feet are included with this version. Finally the "before" and "after" shot. BIG difference. And finally the finished firewall painted. I decided to experiment with John Deere Blitz Black here and I'm very pleased with the results. I actually like it better than the "Hot Rod Flatz" black that I sprayed on the chassis. Although it is an enamel and not a urethane it seemed to lay down better and the overall finish is more consistent than the Hot Rod Flatz was. If you notice you'll see an "L" shaped indentation on the passengers side of the firewall. This was done (after thinking about it a while) just to add a little extra clearance between the passenger's side head and the firewall. I had about a half inch but decided that wasn't quite enough so I just created this indentation to solve the problem. The underside of the body has been sanded and coated with truck bed liner at this point as well. With the under side and firewall done I will be sanding the jell coat to prepare it for primer in the next few weeks. I've decided to do all the bodywork and finish painting with the body permanently mounted on the frame. I'm doing this for a couple reasons one being that with the body firmly mounted on the chassis it won't move or flex so all the bodywork will fit properly and I won't have to worry about things not being aligned when I'm done. Secondly, it's just easier to paint the body with it mounted on the chassis. Sure it will take a lot of extra masking but that's one of the compromises I'm willing to make.